Swamp Head Brewery is all about beer, fun, and the local community. Continue reading to see why you need to visit this inspiring Gainesville brewery! 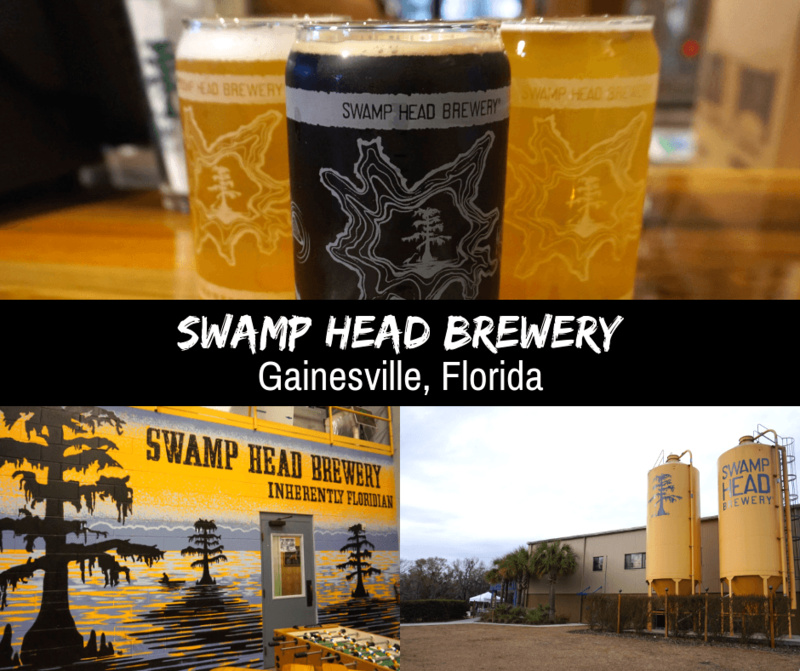 Swamp Head Brewery was founded in 2008 and from the beginning made it their goal to be known as Florida’s brewery. Everything about them proudly shows their love for Florida, from their beer names to their logo. That is why Swamp Head Brewery is Inherently Floridian. Swamp Head Brewery has a tasting room called “The Wetlands” where you can hang out with friends, watch a game, and drink a few cold ones. A favorite beer among most visitors is the Swamp Head Brewery Big Nose, an India Pale Ale. There is both indoor and outdoor seating, and in case you’re wondering, Swamp Head Brewery is dog friendly! The Wetlands does not currently offer any food, but you are more than welcome to bring your own (just remember to clean up after yourself). There is usually at least one food truck parked outside on most days as well. Pro Tip: Hungry? Here are the Best Restaurants In Gainesville. Want to know more about the brewing process? We suggest taking a Swamp Head Brewery Tour. The tour costs $5 in cash and includes a limited edition tour pint glass filled with one of their year round beers. Sign up is at the bar and you must be 21 years old. Tours are done on a first come, first serve basis and fill up quickly so we recommend getting there early. Tours are held on Tuesdays at 5:30pm, 6:30pm and 7:30pm and also on Saturdays and Sundays at 2pm, 3pm, 4pm and 5pm. Start your tour with a beer! Swamp Head Brewery is a fun place to hang out regardless, but even more so when they have special events. Many include food trucks, live music, games, prizes, and can releases. Many events also benefit local charities. Their website lists all upcoming events. Pro Tip: For more fun times, check out these Top Things To Do In Gainesville. This Gainesville brewery is the first in Florida with solar panels. They also source their ingredients from local farms. Why? Because sustainability is very important to Swamp Head Brewery. In fact, they consistently go out and make a difference in their community. Since 2015 they have planted over 150,000 trees and in 2017 alone they collected over 10 tons of trash from Florida coasts. How amazing is that?? Occasionally hours may change due to special events. I wish Swamp Head Brewery had been around when I went to the University of Florida, many moons ago. Although I personally don’t drink beer, it’s definitely a fun place to hang out and I love all of the events that they have there. Let me tell you, it’s the place to go on a Friday night before a Gator’s game! I also love their passion for all things Florida, and how involved they are with the local community. And I may not have drank any beer while I was there, but the friends I was with all loved theirs lol! So to find out more about Swamp Head Brewery’s beers, events, and sustainability efforts, make sure you head over to their website. And Go Gators!! Rocking post as always Vicky. Loving the featured image up top. When I think Gainesville I am always on the Gators but more than a quality football team and college makes its home in this town I see. Thanks for sharing. I had never heard of Swamp Head Brewery before. The atmosphere of their tasting room looks so cosy. I think it’s great that they interact with the community through their events, and also the tree planting and coastal cleanups. More than just being a brewery in Florida, they truly are Florida’s brewery. Yes!! I’ve never heard of any brewery doing so much for their community. They love Florida and want to take care of it. Yeah, I don’t drink beer either but it has been interesting to see the rise in micro breweries in the States. Can you imagine if it was there when you went to school? Maybe that’s not such a bad thing….. I think I’d wait till there was a special event that brought in the food trucks! I’m much more into discovering new foods than drinking! I do like brewery tours, well, mainly the tasting part. 🙂 I really like the unusual can designs. Really pretty! We love to try local beer when we travel. Visiting the local brewery gives you a perspective into how that beer might be different. Something called Swamp Head would certainly be a fun one to visit. Love that they call their tasting room The Wetlands. The can design is awesome. Very cool that there is a food truck there to find your perfect pairing! I am not a big beer drinker. But do like to try new ones. I love that Swamp Head is not just a simple brewery but they are doing something great for the community too! How inspiring! It must be a great place to hangout with friends too. I must check their website first for the upcoming events especially you mentioned that many events there also benefits local charities wow! Kudos to this amazing brewery! We were just driving through Gainesville last night and looking for a place for dinner. Swamp Head wouldn’t work since they don’t serve food but dang it looks like a good time. I don’t know why they made LSU yellow and blue their branding colors. Looks like fun! Why is it that I really only like beer on brewery tours – I never drink it in bars (and actually don’t enjoy it when I try). But on a brewery tour like this one to swamp head, I get into the spirit! Awesome that they’re dog friendly! (I assume that’s just for the outdoor seating?) I’m a big IPA fan so I would love to try their signature beer. Love their logo and can designs too. Swamp Head brewery sounds like an interesting place to explore. I like that they have an area where you can hang out with friends, watch some sports and enjoy a few beers. I don’t like beer much but I do love learning about the brewing processes and how local hops differentiate themselves from the others.